View and search all text files of a directory in one window as fast as possible. Search a phrase just by clicking on it. Copy text, and create bookmarks with the same ease. If you have to read through many small ASCII text files, e.g. 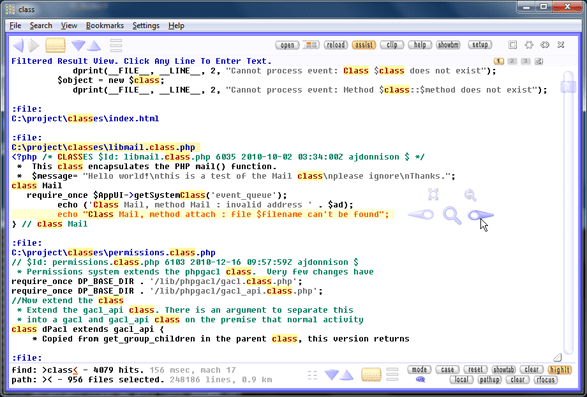 source code, this tool allows text analysis at extreme speeds. For example, to search a word, forget about opening a dialogue, setting options, clicking through results lists to open one result file after another. No, just type the word – and see all matching text lines across all files, instantly. Then, if you see another word of interest, don’t even type it – click on it! And again, you will see all matching text lines, instantly, no matter in what file.